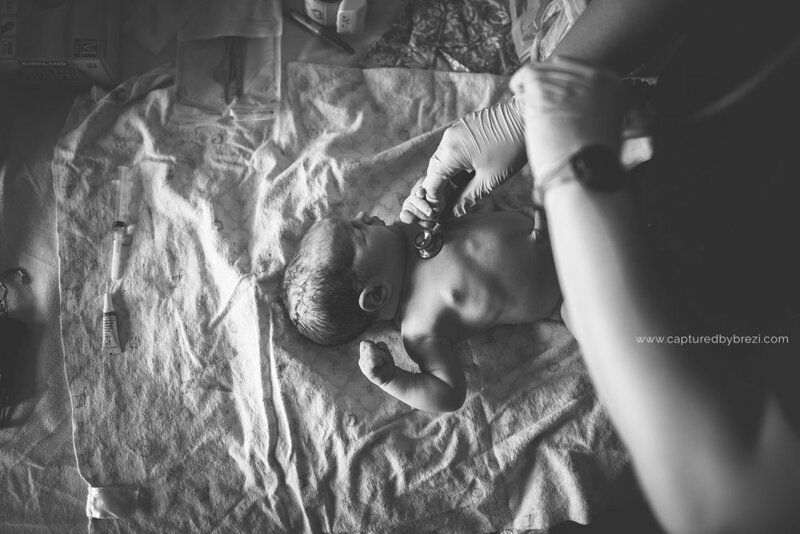 Birth of Gabriel James - Colorado Springs Birth Photography — Love is Photography LLC. A precious baby boy was brought earthside by an incredibly powerful woman. She birthed naturally, at home, a 9 pound 6 ounce baby! The sight was incredible, the team was amazing, and I am so richly blessed to have been able to document it all. Renee recounts her birth journey below. What an honor it truly was to be witness to such a powerful day in your lives. 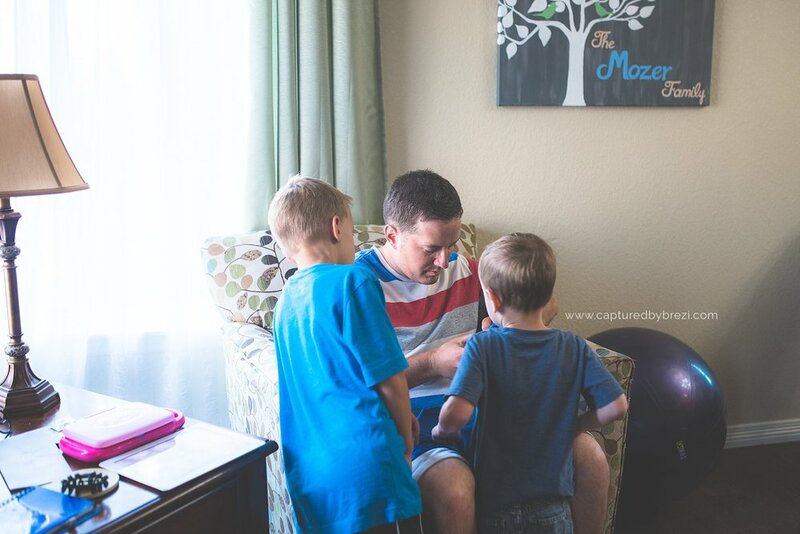 I love the time I got to spend with some of my favorite birth professionals, you, and your family and children. Thank you again for having me present on such a wonderful birth day. Many belssings to your family. All throughout my pregnancy my belly and baby had been measuring about a week ahead, so we all figured he’d either come earlier than my usual post-date babies or he’d be a large baby. As I approached my due date of June 17th, I began having more and more frequent, strong, and painful contractions. My hips were hurting a lot and I was having very intense round ligament pain that would last a day or two at a time and leave me nearly immobile from pain. At midnight on my due date, I awoke with regular, strong contractions. I couldn’t sleep through them anymore, so I got out of bed to labor a while and see what they did. At one point I went outside to walk up and down the block. After walking outside for a half hour or so I went inside and woke my husband Daniel up. I thought the contractions were getting stronger and I felt them very low in my hips. I was also a little panicked that if the contractions picked up quickly we wouldn’t have time to prepare and fill the birth pool since my last two labors had been pretty fast. So Daniel got to work inflating the pool and attaching the hose to the shower. I was hesitant to fill the birth pool until we knew things were definite, since it required a pool liner that was single use only. Once the pool was filled there was no turning back. If it wasn’t true labor, I would be without the pool when labor really took off. 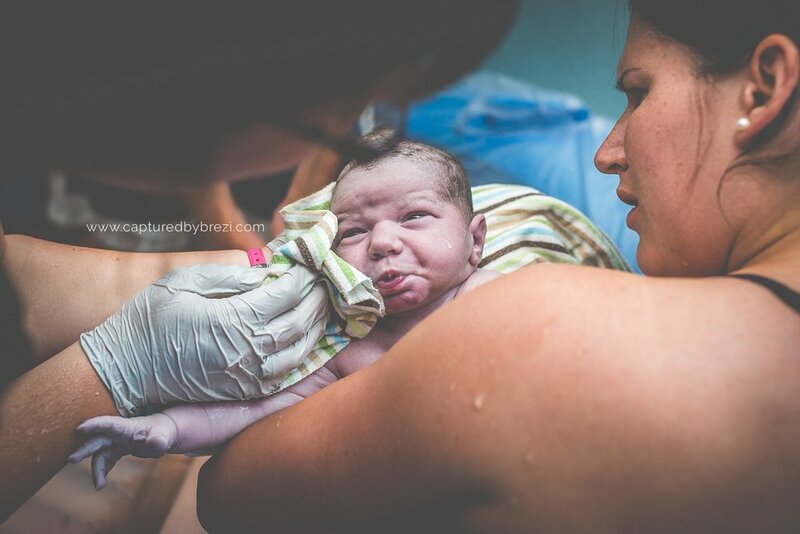 Several times we debated calling our birth photographer Brezi and our midwife, but I kept hesitating. Finally, around 3 AM the contractions started to slow and I crawled into bed to see if I could rest. The contractions spaced out and I slept in between them. When it was time to wake up Friday morning I was completely drained and defeated. All day Friday I was extremely exhausted and still having strong, painful contractions about every 15-20 minutes. Sometimes they’d go away for an hour at a time, but they mostly kept up throughout the day. My parents had arrived the night before, so they watched the kids for me and my mom encouraged me to take a nap or two throughout the day. I was able to nap some, but the contractions never stopped. They continued to hurt and wake me about every 20-30 minutes. It was a very long, rough day. That night when I crawled into bed I just knew there wasn’t much sleep in my future. I was able to doze on and off until about midnight, but continued to have painful contractions that hurt in my hips. At one point I even tried to make a pillow pile that would allow me to sleep on my stomach without crushing my belly. I was desperate to relieve the pain in my hips. That didn’t work, however, and I finally realized at midnight that I would not be getting any more sleep until the baby came out. I got out of bed and tried laboring on the birth ball, then kneeling on the floor laying across the birth ball. I was hoping to find a position where I could labor but still rest in between contractions. Nothing was comfortable, though, so I started timing contractions. I timed from 12:30-1:30 AM before waking Daniel. My contractions were about 4-4.5 minutes apart and strong. I felt a lot of pressure down in my hips, and couldn’t imagine this not being the real thing. Daniel helped time the contractions. I was still pacing and walking around between contractions, but it was getting harder to focus. When my contractions started to come every 2.5-3.5 minutes we decided to call Brezi and my midwife Tiffany. Tiffany told Daniel to get the birth pool filled and she’d be on her way. Daniel started filling the birth pool while I went downstairs to wake my parents. They had wanted to be awakened as soon as we were sure it was labor. I made it downstairs, had a strong contraction and then another one, and then was able to get into the guest room to wake them up. Then I had a couple more contractions before I braved going up the stairs again. By the time I made it back upstairs to the bedroom, Daniel was filling the birth pool and I continued to pace and stop for contractions. No matter what positions I tried, I was just too uncomfortable. The best thing for me to do was pace back and forth and stop for contractions but remain standing. It felt good to press a heating pad against my lower back during the contractions. It seemed like no time passed at all and suddenly Brezi was there. Minutes later Tiffany arrived and so did one of her assistants. They began hauling in bags and setting up around the room. In between contractions, Tiffany used a Doppler to check on the baby and took my blood pressure. Then she tried to monitor baby through a contraction. Everything was fine, so they finished setting up, then dimmed the lights and left the room. My contractions had slowed a bit while everyone was rushing around the room, so they left us alone to get back in our rhythm and get things going again. Daniel and I labored in the dark room, hoping things would pick up quickly. They did not. After 20 minutes, Tiffany came back in to monitor baby and see how everything was going. Baby was doing great, but contractions were still only about 5 minutes apart. She asked whether I had spent any time laboring on all fours yet. I told her I hadn’t because I had been too afraid to cause any round ligament pain. She thought for a minute and then recommended that I try to lift my belly up and in during contractions to encourage baby to drop into my pelvis, since my baby was sticking so far out from my body. Then she left the room again to let us labor in peace. I tried to lift my belly during the next couple contractions but it was SO painful. I gave up on that and decided to lay on my back in bed for a few contractions. I was so tired from not getting any sleep and enduring these contractions for the past day or so. I figured laying on my back would at least let gravity put baby closer to my spine and hopefully encourage more progression. In that position I had about 3 really strong, intense contractions, but then everything slowed WAY down. 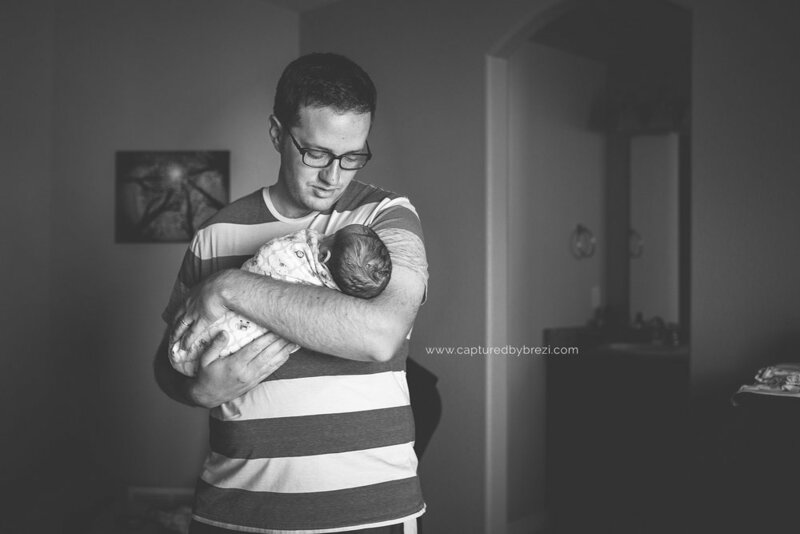 After the noticeable drop-off in contractions, I had Daniel call Tiffany back into the room. It was 3 AM and I was so terrified that labor was stopping again just like the night before. I had called all these people in and everything was prepared. I just couldn’t bear the thought of labor stopping and having to send everyone home. Tiffany came in and we talked about it. She said she could check me to see what progress we had made, so we agreed. Daniel and I were both worried she would check me and say I was only 2 cm dilated and not progressing at all. Luckily, she said I was 6-7 cm and the bag of waters was bulging. This was good news and brought a sense of relief. We were, in fact, in labor! Tiffany brought her two assistants into the room (another one had arrived during my laboring) and they had me take a really nasty cohosh (black or blue – I can’t remember). Both are herbs to induce labor. Tiffany also rubbed an essential oil on my belly. All of this was to help increase the intensity of contractions again. Then they left us to labor. My contractions started to pick up again. With renewed confidence, I began to pace the room. Daniel and I labored like this for a while. He began rubbing my lower back during contractions, as they were causing a lot of pelvic pain. After a while I started to feel the urge to push and contractions were very intense. My tone changed and after a few contractions like that Tiffany and her assistants came into the room. I was grunting and feeling a lot of pressure, so they said it was time to get in the birth pool. As soon as I got in the pool there was a huge sense of relief. The water felt amazing! After a little while laboring in the pool it was looking like we were close to pushing a baby out, so my parents went down to wake up David and Jonah since they wanted to be present for the birth. I think it was around 5:15-5:30 AM at this point. We labored in the pool for a while, but my contractions started to slow again. Tiffany put some of the same essential oil she used on my belly onto a tissue and had someone wave it in front of my nose in between contractions. Still, the contractions slowed. Tiffany checked me while I was in the pool and discovered an anterior cervical lip. She encouraged me to labor on all fours for a bit. Through a few contractions she reached in and tried to push the cervical lip out of the way. I was screaming through all this, so my parents took the kids out of the room; however, the contractions had nearly stopped. At this point, Tiffany said I needed to get out of the birth pool and labor on the toilet for a while. This was NOT what I wanted to hear. I think it was at this point where my attitude completely dropped and I was getting worried this baby wasn’t going to come out the traditional way. Everyone helped me out of the pool and to the toilet. They had me sit backwards on the toilet so I could lean over the tank and have my back rubbed. I was given a dose of the other cohosh (black or blue) that I hadn’t received before. Also gross. Contractions began to pick up, but very slowly. I stayed there for a while, but eventually my pelvic pain was just too unbearable. I told them I couldn’t sit on the toilet any longer. Daniel and I made our way back out into the main area of the bathroom and Tiffany said we should try lunges during contractions to encourage baby to rotate and drop. So I put my left leg up on the edge of the bath tub during the next contraction. Daniel encourage me to lunge deep during the contraction. It was too painful. Instead I lunged in and out, in and out, during each contraction. We did two lunges on each side for four contractions. I asked Tiffany if baby was in the wrong position and if that’s why he wasn’t dropping. I said it was feeling a lot like my labor with David (who was turned wrong). She said she had no reason to believe baby was in the wrong position, but she could check his position if I wanted. She said I’d need to lie on the bed for it, though. It took a few contractions to work up the courage to lie down. But eventually I did and she noted that his back was off to my left side a bit. I begged her to break my water, hoping this would help him drop down into my pelvis. She reluctantly agreed to do it. Then I got out of bed and they put a stretchy pair of undies on me and a pad. After a few contractions, Tiffany said we should try having me lie on my right side with my left leg crossed over, in an exaggerated prone position. This was excruciating. I screamed and screamed during the contractions. At this point I had totally lost it. I told Tiffany the baby wasn’t going to fit. He’s too big. I was desperate to go to the hospital and just have a c section. Daniel told me that was absolutely not an option. Tiffany encouraged me to stop the negative attitude and get back to a positive place. Gabriel James arrived at 7:44 AM on June 18th, weighing 9 lbs 6 oz and 20.75 inches long. It took a little bit for Gabriel to swallow the amniotic fluid he had in his mouth and then he finally breathed for us. Everyone rushed into the room – my parents and the kids. I stayed in the pool for only a few minutes before the bed was ready and everyone helped Gabriel and I get out of the pool and over to the bed. I got on the bed and Tiffany pressed on my belly a bit. Then she said to give her a big push. I did, and the placenta came right out. Someone, either Tiffany or one of the assistants, said, “Congratulations, you’re no longer pregnant!” Those were the most beautiful words I’d ever heard! Tiffany inspected the placenta, and described everything she was doing to one of her assistants (whom she was training). She had been informing her of things all throughout the labor, so it was nice to hear what they were doing and why. They put the placenta in a couple grocery bags and laid it next to me. We were left to enjoy baby while they started cleaning up the birth pool and other items throughout the room. After a while Tiffany performed all the newborn examination procedures right there on the bed in front of me. Daniel cut the umbilical cord. We had left it attached for over an hour! So impressive and so unlike the hospital atmosphere. Lots of photos were taken and lots of happiness and joy was in the air. My mom brought me food. Daniel got fresh coffee. We all mentioned how Gabriel didn’t look large. We all guessed he’d be in the same weight range as my other two boys. I guessed 8 lbs 13 oz. Finally, Tiffany weighed him. She hung him in a sling and looked at the scale. She told everyone to, “Come and take a look at this!” Everyone gathered around the scale and gasped. Brezi took a photo. Finally, Tiffany told me what the weight was. When I heard it I sobbed and sobbed. No wonder it was so hard to push him out! After all the examinations had taken place and everything was cleaned up, Tiffany and her assistants left. It was so amazing to have everyone come to me and then clean up and leave us to rest at home. What an amazing experience, even though the labor was more difficult than I was anticipating. 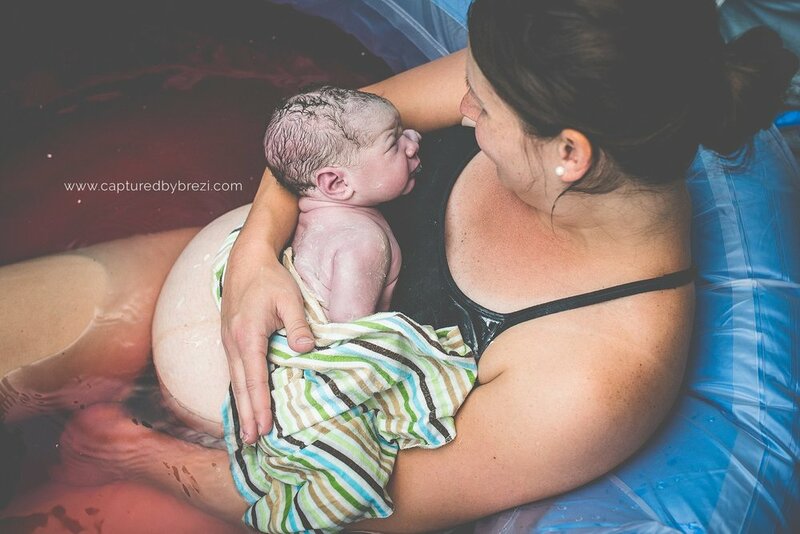 A home birth was absolutely the best choice for us and I am so glad we had such a supportive team of people helping us through it!